Your Iowa Barnstormers are the 2018 UNITED BOWL CHAMPIONS! 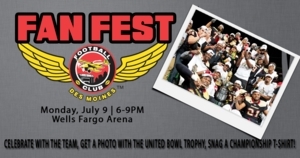 Celebrate with the team during FAN FEST on Monday, July 9 at Wells Fargo Arena right on the Iowa Barnstormers field! Doors open at 6:00pm. Fans must enter through the North VIP Entrance of Wells Fargo Arena for the event. Celebrate with the team, get your photo taken with the trophy, and get your Championship T-Shirts and Hats! One concession stand will be open during the event!